Elections matter. And Bread for the World, along with partner organizations, wants to ensure that ending hunger and poverty becomes a high priority for our next president and Congress. In fact, we want them to take concrete actions that will put our nation and the world on track to end hunger by 2030. With that goal in mind, the Vote to End Hunger (VTEH), a new coalition, took root last month with a formal launch during the Iowa Hunger Summit in Des Moines. The launch was the highlight of the summit, which culminated with the official presentation of the World Food Prize for 2015 to Sir Fazle Hasan Abed. But can we really "vote to end hunger"? Approximately 700 hunger activists attending the summit jumped to their feet and cheered loudly that their votes indeed could end hunger. Bishop Richard Pates, Roman Catholic archbishop of Des Moines, echoed this sentiment at the launch. “Iowa’s first-in-the-nation status gives us the opportunity to bring this issue to the forefront in the 2016 elections,” he said. So far, dozens of organizations and individuals have signed on to the VTEH coalition. On Nov. 8, the four dioceses of the Iowa Catholic Conference, Bread for the World, and Methodist, Lutheran, and Episcopal churches, sponsored a Vote to End Hunger rally at Grand View University. The Des Moines university is affiliated with the Evangelical Lutheran Church in America. Editor’s note: Rev. Dr. Sharon E. Watkins was a participant at an interfaith summit last month where Bread for the World and other partners brought together 100 religious leaders to discuss how to end hunger and poverty by 2030. This article is adapted from remarks she made the day after the summit. Our different faith traditions find common ground in the call for us to advocate for our neighbors — our local and global neighbors — who struggle with hunger and poverty. Christians take our cue on this from the ministry of Jesus who saw to it that all the people were fed. The 2008 financial crisis brought a food crisis as well — a 40 percent increase in food insecurity in this country. And yet, since 2011, powerful, political forces have pushed for deep and disproportionate cuts in all the programs that go mainly to people in poverty. She’s right. We need to treat hunger as a systemic issue. Small groups of volunteers make a difference. But to get the job done, it will take all of us working together. This reality has already stirred leaders from all this country's faith traditions to join to protect programs for low-income people. After months of fiscal gridlock on Capitol Hill, with threats of a government shutdown or a U.S. default, Congress last month finally passed a two-year federal budget agreement. The deal was struck just days before House Speaker John A. Boehner of Ohio turned over his gavel to Rep. Paul Ryan of Wisconsin. This is a momentous victory for Bread for the World members, who spent all year pushing hard for a budget deal that would stop the automatic spending cuts known as sequestration. Sequestration was intended to be the “stick” that convinced Congress to reach a budget deal for 2013: indiscriminate, across-the-board cuts so drastic that both parties would make compromises to avoid them. But those negotiations failed, and since then, Bread members have been working to limit sequestration’s damage to programs that help hungry and poor people. The budget agreement just reached will prevent about 75 percent of the cuts that would otherwise have been triggered by sequestration in 2016 and 2017 — about $80 billion in “relief” from sequestration. The Bipartisan Budget Act of 2015, the agreement’s formal name, was the product of discussions between congressional leaders and the White House, but it was also a consequence of vocal advocacy from people across the country, demanding a better budget. Congress just passed a major budget deal, the Bipartisan Budget Act of 2015, which includes $80 billion of relief from harmful automatic budget cuts, or sequestration, over two years. This is a huge win. The relief means that there will be additional funding available for programs — both defense and non-defense spending. However, now congressional leaders must decide how to parcel out this funding by Dec. 11. Urge Congress to prioritize people struggling with hunger and poverty. Tell them to direct funding toward anti-hunger programs, such as WIC, Head Start, low-income housing assistance, Feed the Future, and the McGovern-Dole Food for Education Program. Call the Capitol switchboard to be connected to your member of Congress: 202/224-3121. Or email your member of Congress. Hayen, an Iowa native, took her vows in 1961 and then attended college and earned a master’s degree in biology. She created a hands-on elementary science curriculum as part of her master’s thesis at St. Mary’s College in Minnesota and then returned to Iowa to teach. 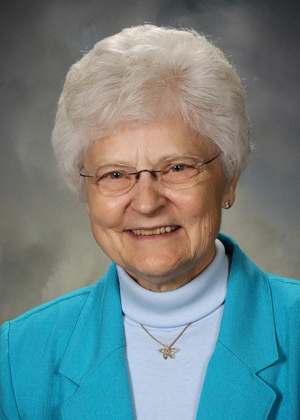 It was during the years she taught at Catholic schools in Davenport and Dubuque, she recalls, that she received a letter from Bread for the World. It described Bread’s mission and simple actions people can take to help, such as writing letters to their members of Congress that press for legislative changes to help hungry people. Hayen remembers thinking, “Here is something to help the students be more social justice-minded—and that I could do along with students and staff.” She was inspired to lead an Offering of Letters—the first of many in a history of advocacy that now spans 30 years and is still going strong. The locations and the letter-writers vary, but the Offering of Letters is always about engaging churches, campuses, and other faith communities in writing letters to Congress. The letters are presented as an offering to God before they are mailed. Across Liberia, Sierra Leone and Guinea, the 2014-2015 Ebola crisis affected hundreds of thousands of families. Husbands lost wives, children lost parents, and communities lost entire families to the deadly disease. While Ebola brought an unprecedented health epidemic, it also gave rise to a less visible crisis — a food crisis. Respect described how Ebola hit her community during the early summer of 2014, and how it was one of the first to be affected by what would soon take thousands of lives throughout the region. In Respect’s village, after a pregnant woman died from what was thought to be complications from an abortion, and after her family performed a traditional burial ceremony, it was discovered that she had in fact died from Ebola. The virus spread rapidly through Respect’s community, taking 18 lives. Over the course of the Ebola crisis, Respect’s village was quarantined more than 10 times. Moreover, Respect, along with the rest of her community, was stigmatized and unable to sell anything in the market. As time went on, borders closed, food prices rose, markets were further disrupted, and food became less accessible to the most vulnerable households. Some families were forced to eat seeds normally used for planting or sell their tools to buy food. Get your 2015 Christmas cards today! When you send Bread for the World cards, your family and friends learn about our vital work to end hunger. A pack of 10 cards and envelopes is just $15, shipping included. Multiple designs are available. Order online, or call 800/822-7323, ext. 1072 to order your cards today. Bread for the World’s 2016 Offering of Letters will focus on ending preventable maternal and child death through nutrition. Zambia will feature prominently in stories. The country is a focus of the Feed the Future program — the U.S. government's global food security initiative. The 2016 toolkit for coordinators of letter-writing events will contain many of the same items that past years’ kits have contained — how-to-information on planning an event, an explanation of the issue, items to help promote your event, videos to show during a presentation, a sample PowerPoint presentation, and more. The Offering of Letters content will be on the Bread for the World website. In addition, materials will be available in Spanish. Watch the newsletter, Bread’s blog, and social media channels for more information about next year’s Offering of Letters. You can give a gift of hope and opportunity to hungry people with your year-end contribution to Bread for the World. Make your gift today by visiting www.bread.org/give. Tax-deductible gifts to Bread for the World Institute support research and analysis that shapes policies and legislation that will help end hunger. More and more Bread for the World members are making charitable gifts by transferring appreciated stocks to Bread for the World Institute. If you wish to arrange a stock transfer, contact Kierra Stuvland at 800/822-7323, ext. 1150 or email: kstuvland@bread.org. Christians take our cue from the ministry of Jesus who saw to it that all the people were fed.